Our originally designed crystal suncatchers capture the sun's rays and reflect light gorgeously as they hang in a window or around a car rearview mirror. You can even hang them on your Christmas Tree! Or you can add your favorite necklace chain for a unique look. 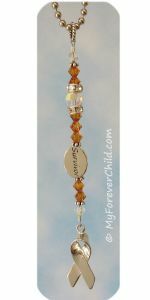 Personalized with genuine Swarovski Crystal birthstone or awareness colors. 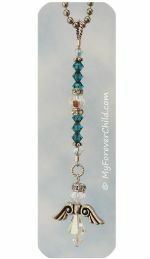 With several charms and message bead sayings to choose from, you can create the suncatcher that`s meaningful for you. Our crystal memorial suncatchers are among our most popular decorative sympathy gifts. "I got my suncatcher today and I love it. I put it in my car as soon as I got it and will have it there always to remember my little angel!! I am so glad that someone out there is talented enough to come up with designs such as these so that we may have something to always remember our babies by. Thanks for all you do for all of us that have lost children. ~Lyndsi M."